Last month NASA gave the “all systems go” for a new mission to Europa. But why go back? After all, we’re still sifting through the data from the Galileo probes fly-bys from more than a decade ago. The short answer: it’s all about life. The Jovian moons – named after Jupiter’s lovers by Simon Marius – have been a source of scientific speculation since Galileo trained his telescope on Jupiter in 1610, announcing his discovery in the Sidereal Messenger. 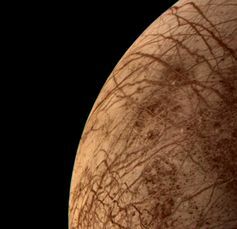 But the idea that Europa and other moons of Jupiter might harbour life is relatively new, as is the notion they might have hidden oceans beneath their icy surfaces. Indeed, these speculations demonstrate just how fast our conceptions of the solar system, and life, can change. A generation of space scientists and enthusiasts who grew up on Robert A. Heinlein’s “juveniles” will fondly remember Farmer in the Sky, written in 1950, when the Jovian moons were believed to be rocky, like our own Moon. But in the late 1950s and continuing through the early 1970s, a growing body of telescopic data suggested that some of these moons, in particular Callisto, Ganymede and Europa, were covered in water ice. This speculation came from their high albedo, a measure of how much they light they reflect. With an albedo of 0.64, Europa is one of the most reflective bodies in the solar system. In 1971, Carl Sagan suggested that the Jovian moons, including Europa, were of “major…exobiological significance”. In other words: they might harbour life. Europa as seen by Voyager 2 during its close encounter in 1979. The early 1970s also saw the first speculation that some outer moons of the solar system, including Europa, might hide an ocean beneath their surfaces. It was initially suggested this might be due to radiative heating, although it was later proposed that the heat might come from tidal forces induced by Jupiter, especially because of the synchronous orbits of the three innermost Galilean moons: Io, Europa and Ganymede. The 1979 Voyager fly-bys confirmed that Callisto, Europa and Ganymede moons were covered in ice and that Io was extremely volcanic. The best images of Europa were taken by Voyager 2 from a range of 204,400 kilometres, showing Europa to be “billiard ball” smooth. 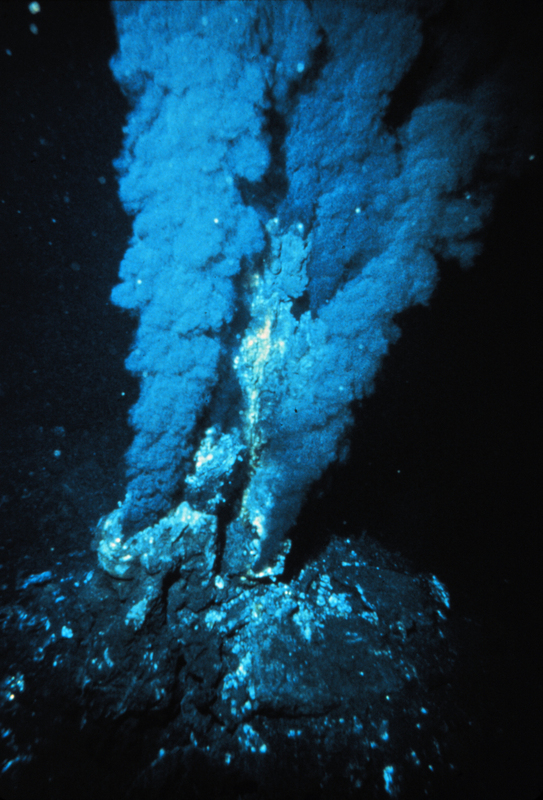 Things took a turn following the discovery by Robert Ballard’s 1977 expedition of entire ecosystems thriving near hydrothermal vents in the deep ocean. These vents existed in the “midnight zone”, without sunlight and photosynthesis, and changed the way we thought about life. The discovery of life around deep ocean vents, like this one, raised the exciting prospect of life existing under the ocean on Europa. In 1980, scientists Gerald Feinberg and Robert Shapiro hypothesised that deep sea volcanism might support life on the Jovian moons. The Feinberg-Shapiro hypothesis is one of the major reasons for the current interest in Europa by astrobiologists. In essence, it was proposed there might be a tidally heated habitable zone around giant planets, similar to the habitable, or “Goldilocks” zone around a star: where it’s not to hot, not to cold, and where liquid water and life can exist. The idea of life on the Jovian moons was quickly picked up by science fiction writers. In Arthur C. Clarke’s 2010: Odyssey two (1982) and 2061: Odyssey three (1988), aliens transform Jupiter into a star kick-starting the evolution of life on Europa, transforming it into a tropical ocean world forbidden to humans. In Bruce Sterling’s 1985 Nebula Award nominee, Schismatrix, Europa’s ocean is colonised by a group of genetically transformed post-human species. Europa and life were thus well and truly established in the minds of science fiction writers, planetary scientists, exobiologists and the public by the time NASA’s extraordinary Galileo mission began taking images of Europa in 1996. 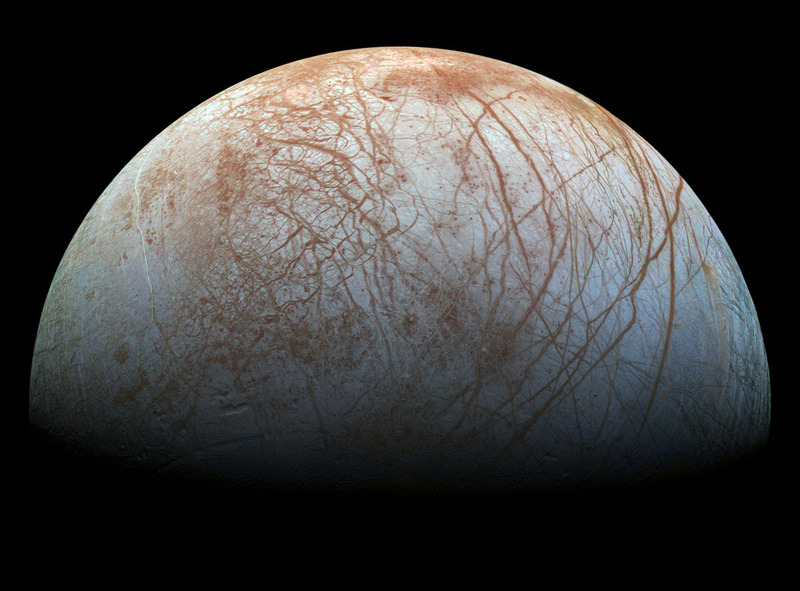 This is the colour view of Europa from Galileo, taken in the 1990s, that shows the largest portion of the moon’s surface at the highest resolution. By the completion of its primary mission on December 7 1997, Galileo had made eleven encounters with Europa. Galileo’s extended mission became one of “fire and ice”: its twin foci were Io’s vulcanism and Europa’s icy oceans. The Europa fly-bys took the probe to within a few hundred kilometres of the moon’s surface. These extensive observations of Europa by the Galileo mission were compelling evidence for a liquid water ocean some 100 to 200 kilometres thick on which “floats” an outer shell of ice. Magnetometer measurements indicate the ocean is free flowing and salty. Galileo also provided spectacular views of the icy terrain: ridges, slip faults and “ice-bergs”, all adding to the picture of a surface only 10-100 million years old, which is young by the four to five billion year age of the solar system. The spacecraft, nearly out of fuel after an extended mission, was deliberately crashed into Jupiter on 21 September 2003 to protect Europa from possible contamination. The data Galileo collected are still revealing new important finds. There evidence of clay-like minerals on the surface, possibly from asteroid or meteorite collision, and signs of sea salt, discoloured by radiation, making up some of the dark patches observed by both Voyager and Galileo. A whole new generation of scientists is eagerly awaiting the data from the new mission. Astrobiology has become, since the early 2000s, a whole new science discipline. This “alien ocean” mission is clumsily named, at present, Europa Multiple Flyby Mission. So the new mission, slated for a rendezvous with Europa in 2030, won’t involve a lander. And until we can send a probe into the icy depths of Europa’s sea, speculation about what might be lurking there, à la Sebastián Cordero’s Europa Report, will remain the domain of science fiction and scientists’ fantasy. Maybe one day, it will be science fact. Europa, here we come. Morgan Saletta is Doctoral Candidate History and Philosophy of Science at University of Melbourne. Kevin Orrman-Rossiter is Graduate Student, History & Philosophy of Science at University of Melbourne.